We appreciate your input here at Deckstainhelp.com as we continue to be your go-to source for the latest in deck restoration news and trending topics through 2019. 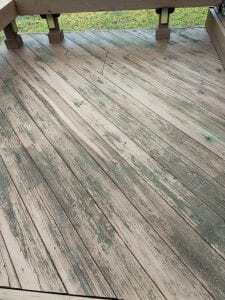 See below for an article about Deck Stain Turns Black from Tree Pollen. When Your Deck Stain Turns Black from Tree Pollen, what happened and how to fix? You’ve followed all the steps to ensure your deck stain project has a beautiful finish. You properly prepped it, allowed for it to dry before staining (unless you used Restore-A-Deck), then stained it meticulously in a beautiful semi-transparent finish. However, you are left with black mildew spots on the finished wood surface down the road. How did this happen? We hear complaints about this problem within our community, and we’ve seen it with our own eyes when we survey wood decks. One thing you may have not considered is whether the deck is near a pollinating tree. Tree pollen can fall on a drying oil-based deck stain project and promote the growth of mildew which causes the black specks or spots. To prevent this, make sure you start your wood stain project when your trees are not going through their peak pollination phase if using an oil-based stain. 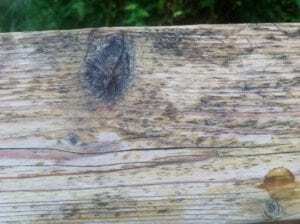 If the pollen falls on the drying wood stain, it can attach to the surface of the wood, promoting the growth of mildew. Always make sure you are properly cleaning your wood deck prior to brightening and staining as well. Another option to avoid this from happening is to use a water-based deck stain. The best brands we have used and tested for a water-based penetrating semi-transparent stain would be the Restore-A-Deck Wood Stain and the Defy Extreme Wood Stain. Deckstainhelp.com is your number one source for deck staining tips and trends on the internet in 2019. Mold and mildew can appear on your wood decks, see below for why this happens and what you can do to prevent it. Leave us a comment if you’ve encountered mold and mildew on wood decks. One of the most common natural occurrences that plague decks are mold and mildew. Mold is the term that most people refer to when they see green algae, moss, lichen, and fungal growth. Mildew on decks is commonly seen as small black spots that can be imbedded in the wood or an old stain. Without getting too technical, mold is a good general term for explaining this nasty contaminant that is seen growing on decks all across the country. One deck may by more prone to mold than another deck depending on its location. Climate, region, shade, sun exposure, and humidity all play a part in mold and fungal growth. In fact, some deck stains are even more prone to mold than others. Mold on decks can cause a variety of problems. Obviously, unsightly appearance is one major concern. There is nothing worse than a green deck floor that is suffering from mold issues. Mold can also be treacherous to walk on especially when wet. Mold and fungal growth are very slippery and have no place on deck flooring or steps. You might as well put out a “slippery when wet” sign to keep from getting sued. To be serious though it can be extremely dangerous. Some of the other not so commonly known problems with mold is wood rot and decay. Mold can only survive when it has enough moisture. This constant moisture wreaks havoc on a deck’s surface. The damage can be superficial or can go as far as to cause major structural damage.